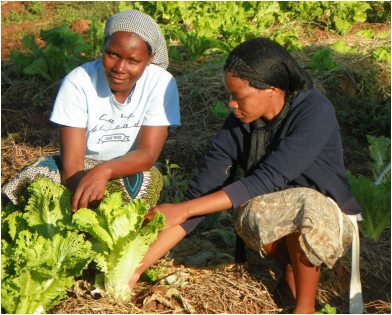 The Farmers’ Club Program utilizes a bottom-up approach with respect to addressing farmer needs; it easily adapts to the requirements of an individual region and country (it is currently being implemented in the DR Congo, Malawi, Mozambique, Guinea Bissau, Zimbabwe, and India). Read the UNFAO's report about the vital role of women in agriculture. The essential goal of Farmers’ Club is to create development momentum within rural communities toward positive, productive change that will improve food security and reduce poverty. The primary objectives sought are: 1) improved production and crop yields that increase income, 2) strengthened resiliency and the ability to cope with natural and man-made challenges, 3) improved nutritional status and health. The clubs are supported by a trained agronomist and other professionals and a government extension worker, who facilitate training sessions. The training emphasizes sustainable agricultural techniques, promoting conservation agriculture as a method to obtain higher yields. Farmers are able to experiment with the new techniques on a shared "experimental plot." Upon observing the results first hand, they are more likely to invest in a technique and apply what they have learned to their own fields. The program also recognizes that agricultural development does not occur in a vacuum and that farmers need support in other areas of life that can affect their livelihoods. Participants thus also receive training in health and hygiene, family economics, and HIV/AIDS prevention. Partnerships with local organizations constitute an important part of Farmers' Club, ensuring that the program maximizes impact through widespread support and cooperation. Such partnerships also help facilitate links that farmers need to regional and export markets. Partners in these projects include the ministries of agriculture in each country, other agricultural organizations, companies that supply agricultural inputs and market produce, and organizations that provide low-tech solutions for sourcing irrigation and other agricultural materials.